This refers to a narrowing of the spinal canal. Certain individuals may have a narrow canal from birth, but the majority of individuals develop narrowing with age. With age, wear and tear arthritic spurs build up on the facet joints in the posterior part of the spine. These arthritic spurs then encroach on the spinal canal and pinch the lumbar nerve roots. This condition can be worsened as well by narrowing and degeneration of the disc at that level as the space for exit of the nerve root (called the foramen) is narrowed further by a degenerated disc. Spinal stenosis is most common in the last three levels of the lumbar spine namely L3-4, L4-5 and L5-S1. It is diagnosed and confirmed by an MRI or CAT scan/myelogram. 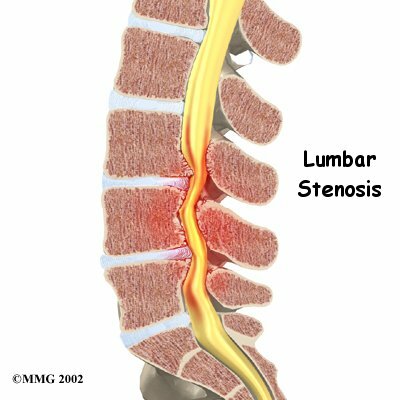 There are various signs and symptoms of spinal stenosis. A common one is referred to as spinal claudication. This refers to pain in the legs, the calves or the buttocks. This pain is associated with activity. The pain is often relieved by sitting and resting. It will then often times start up again with activity. A common complaint is that an individual will be able to walk several blocks then develops leg pain, is able to get rid of the leg pain by sitting and resting for five to ten minutes and then, upon trying to walk another several blocks the pain will return. The pain may be a radiating pain like a sciatica or it may be a cramping pain. At times though, the stenosis may be severe enough that the leg pain is constant and unremitting. It may at times be indistinguishable from the kind of pain that occurs with a herniated disc. Spinal stenosis is uncommon in younger people. It usually occurs at age 50 or older. Leg pains from spinal pathology are more common from herniated discs in people under 50. Over 50 it is more common that spinal stenosis will be the problem. In addition to developmental degenerative spinal stenosis, entrapped nerve roots may be caused as well by spondylolisthesis and scotiosis. There is really no conservative treatment for a spinal stenosis. It will rarely cause paralysis. The condition will tend to gradually worsen with time and cause increasing pain however. Patients with congenital spinal stenosis (such as achondroplastic dwarfs) may develop symptomatic stenosis as early as age 15 or 20.